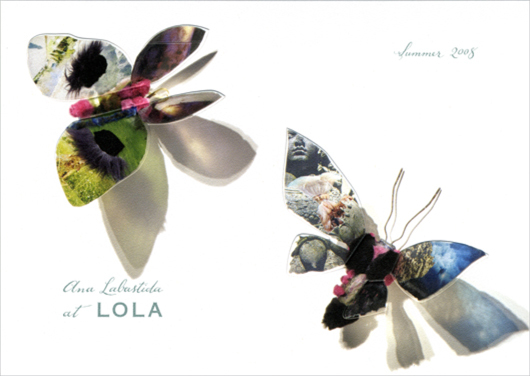 On this beautiful June day I felt inspired to blog about an invitation that I created for an art opening held at Lola Home Store, unfortunately LOLA Home closed it’s doors in 2011…. oh, how I miss that store! However, my memories of all the special events held there, the artists I discovered, and the design projects I got be to be a part of, still live on. The above invitation was for LOLA‘s very first art show. The featured artist was Ana Labastida, a highly creative and talented woman. 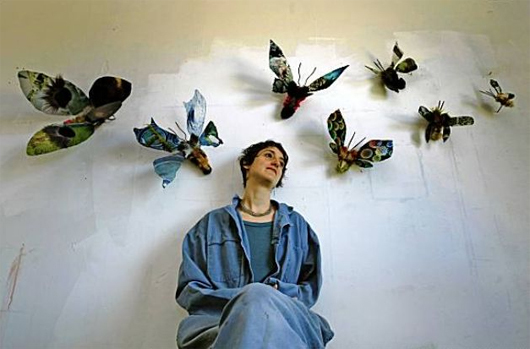 Here is a photograph of Ana in her Emeryville Studio with her incredible works of art (photograph via sfgate). I got to meet the lovely Ana when she was installing her show at LOLA. She cleverly devised an invisible installation technique using small powerful magnets. I loved how her moths looked like they had landed, naturally, all over the shop… it completely transformed the space! Creating the invitation was so fun. 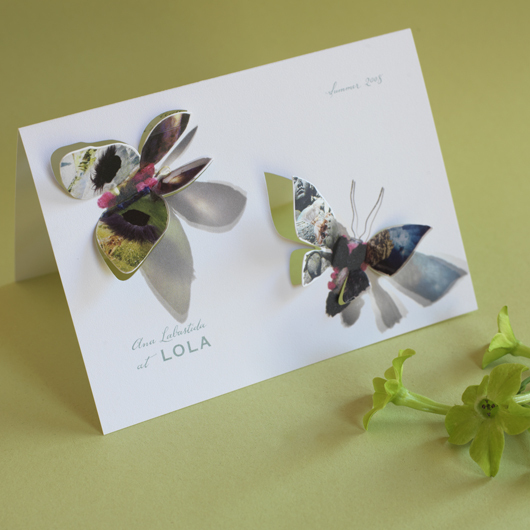 We chose two photographs of Ana’s favorite moths for the front of the card (their wings are made of glass with images collaged onto them, producing the most beautiful shadows). 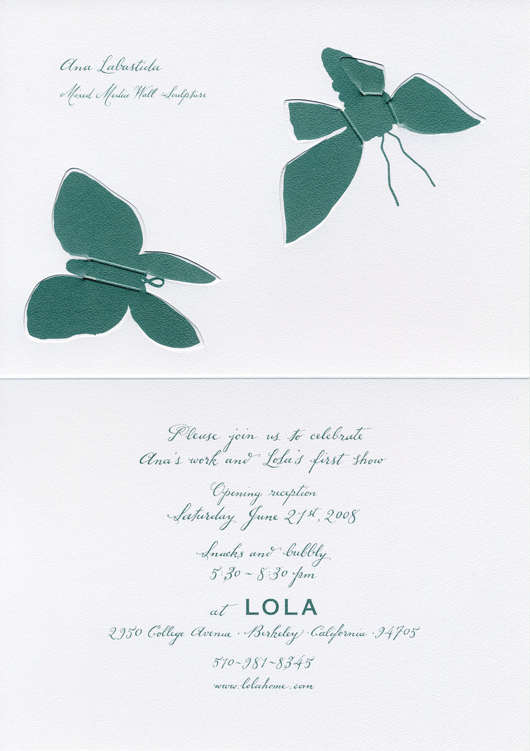 I hand-lettered the wording in a delicate script and had the wings die-cut so that the invitation became 3-dimensional. 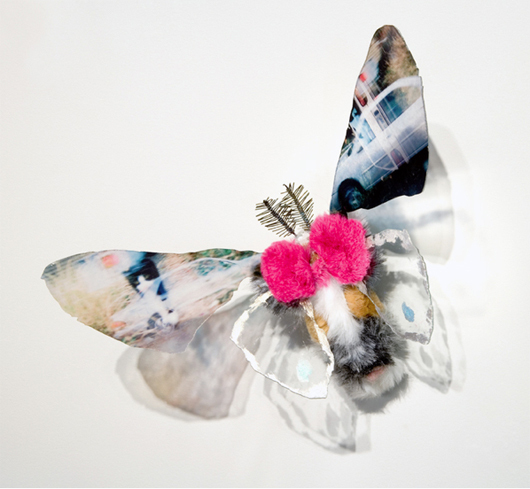 The moths truly looked as though they had landed on the card, such a playful introduction to Ana’s work! Here is a photograph of my favorite piece (photograph courtesy of Ana’s website). You can check out her entire Moth Series along with her wide range of other amazing works.